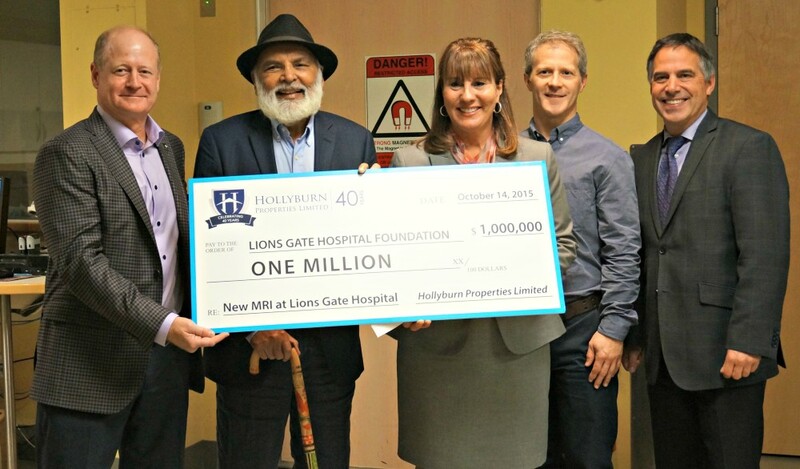 NORTH VANCOUVER – Local property management and development company, Hollyburn Properties Ltd., has donated $1 million to Lions Gate Hospital Foundation to bring new state-of-the-art MRI technology to the Radiology Department at Lions Gate Hospital. Founded on the North Shore by the Sander family, Hollyburn Properties has served the North Shore community by providing quality rental housing for the past 40 years. Several Sander family members were born at Lions Gate Hospital and continue to reside on the North Shore, creating strong personal ties to the community and to LGH. The new MRI technology is scheduled to arrive at Lions Gate Hospital in April. The advanced software will feature algorithms allowing for increased contrast differentiation that will greatly enhance image quality for more accurate diagnostic scans. In addition, many scans will be produced faster, allowing more scans to be completed each day. The noise level during some scanning will be reduced by 97.5% – from 108 to 3 decibels. This has been shown to reduce anxiety in claustrophobic patients and patients with dementia. Currently, up to 3% of imaging time is lost to patients who are too stressed by the close environment in the scanner to continue with the exam.